Congratulations to The Cathedral School in Llandaff, Cardiff, which has been judged by Estyn, Her Majesty’s Inspectorate for Education and Training in Wales as ‘Excellent’ in all five inspection areas. Praising the School’s “high quality of teaching” and the “extremely high standards achieved by pupils”, the report also recognises its care, support and guidance arrangements which “help pupils to develop self-confidence, acquire a broad range of important life skills and to become well-informed and active citizens.” The work the School undertakes in this particular area has been identified as sector-leading practice which will be shared with the education sector in Wales. Chairman of Governors, Mr Gilbert Lloyd said: “The Board of Governors is delighted with Estyn’s report. Being acknowledged as ‘Excellent’ in all five categories is testament to the committed staff, hardworking pupils and supportive parents at the Cathedral School. 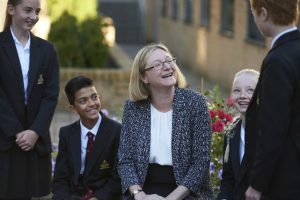 Head of the Cathedral School, Clare Sherwood added: “It is wonderful that this report continues to reaffirm the Cathedral School as an ‘excellent’ school. I am proud that the role of the ‘high quality of teaching’ and our teachers’ ‘passion and enthusiasm’ has been recognised as ‘central to pupils’ strong and sustained progress’”. “It also confirms the ‘extremely positive attitudes to learning’ our pupils have which helps them to ‘develop mature social and life skills and make outstanding pupils as a result’.